We are delighted to announce that Ellis Terry was awarded the New Zealand Prosecution award for 2017 at the Managing IP Global Awards on 9 March 2017. The Managing IP Global Awards recognise the best Intellectual Property firms in the world. The annual awards ceremony, which took place at The Savoy in central London, saw over 250 IP professionals celebrate successes and achievements within the international IP world. Among the accolades this year was Managing IP’s first ever prosecution award for New Zealand, presented to Ellis Terry for its outstanding work in prosecuting patents, trade marks and designs. The increased number of awards for the New Zealand category acknowledges the growing importance of the New Zealand IP landscape. Ellis Terry partner Blayne Peacock said “we are thrilled to accept this award and the acknowledgement of our clients and colleagues around the world. The team at Ellis Terry has worked tirelessly to help protect and enforce innovation for New Zealand based organisations for many years. This recognition is a testament to the success of our clients in their chosen markets and to the high quality of research and development, and products, coming out of kiwi technopreneurs”. For more information, please visit: http://www.managingip.com/Article/3668349/Awards/Managing-IP-Global-Awards-Winners-2017.html. Ellis Terry has offices in Auckland and Wellington and practices in all aspects of intellectual property law. Established to serve a local and international client base, but with a strong New Zealand client focus, we advise on patents, trade marks, registered designs, copyright, litigation and commercial law. We do more than just protect ideas, creativity and brands. We put the legal issues into their proper commercial context so that intellectual property can be managed just like any other business asset. We think outside the box to help develop successful commercial strategies and to implement them through our network of funders, advisors and businesses. Ellis Terry offers legal assistance to innovative entrepreneurs and corporations in a range of industries. Creators of artistic works, inventors and designers from diverse specialist fields, including mechanical, electrical and computer engineering, have sought our guidance. Our trade marks team works with clients from a variety of industries, including the food and beverage, pharmaceutical, technology, film and entertainment, insurance, farming and agricultural, building, clothing and textiles, automotive and wine industries. 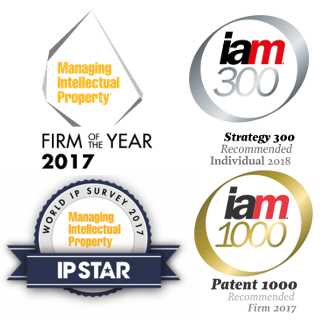 Founded in 1990, Managing IP is the leading source of news and analysis on intellectual property developments worldwide. The annual Managing IP Global Awards are the premier international awards for the intellectual property profession. The awards are based on extensive research and interviews with practitioners worldwide. A team of researchers based in London, Hong Kong and New York contact firms and clients in 75 jurisdictions to ask them for information and feedback. Managing IP is part of the Euromoney Legal Media Group. Euromoney Institutional Investor PLC is listed on the London Stock Exchange.